Waterslide decals for nine subjects with colour scheme & placement guides. Available on-line from these stockists: Freightdog Models for £9.00 and Hannants for £7.50. 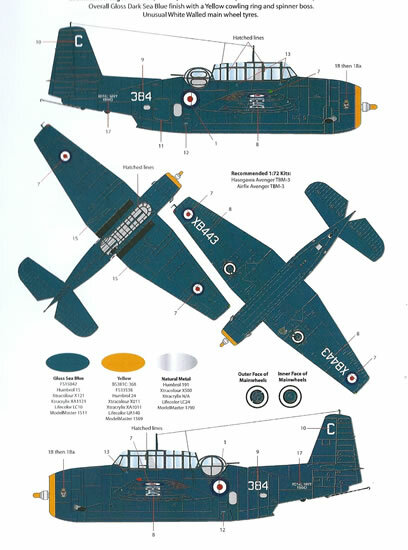 Superb quality decals, good colour guides and attractive subjects. 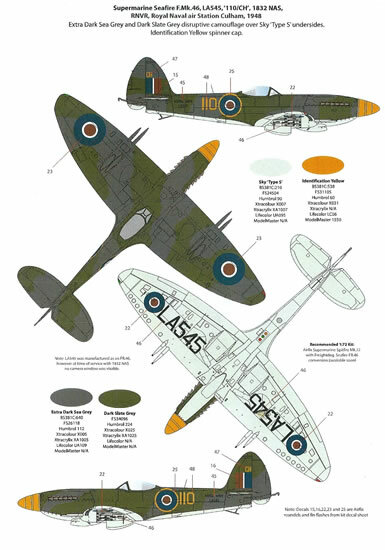 This is a quality package with superb decals and good colour scheme and placement guides. The FAA subject selections are, I think, appealing ones for the period covered by the sheet - Definitely recommended. The Freightdog Models brand should be well known to many for its range of kits, conversions, accessories and decals covering things British. 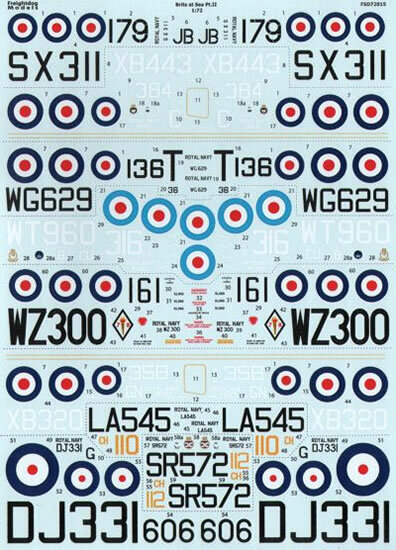 Having just finished a series of FAA builds over the past year I was starting to move on to other subject areas; but now I must confess that I am tempted to return having been sent the decal sheet I am reviewing here. 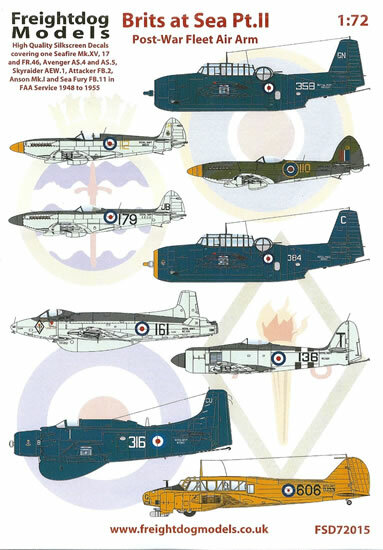 It represents a selection of FAA types in service from 1948-55 with some attractive schemes chosen. 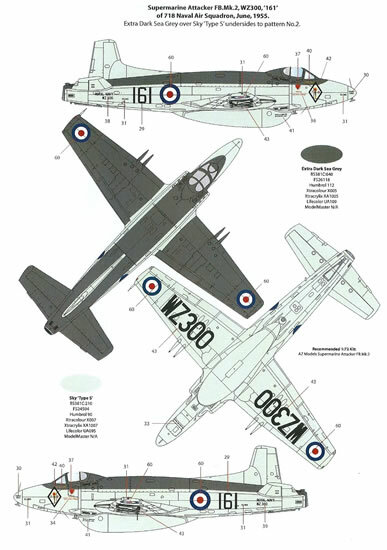 The decals come in the almost universal A5-sized zip-lock bag along with six folded A4 pages of colour scheme and placement guides. 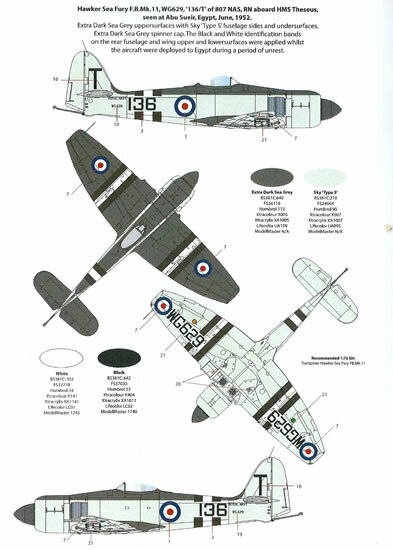 These are attractive, crisply printed in colour, and provide plenty of paint cross-reference information. This consists of both BS381C and FS 595 codes, and colour numbers from the Humbrol, Xtracolour, Xtracrylix, Lifecolour, and Modelmaster paint ranges. Apparently the screen-print run is limited to 200 sheets. Attacker FB.2 WZ300 '161' 718 NAS 1955. To my eye the decals seem to be perfectly registered, and appear to have good colour density too. A sensible amount of fine stenciling is provided where applicable. I was unsure about two thin solid yellow lines that are within the two sections of sheet for the Avengers as these do not seem to be numbered on mentioned in the colour guides. Freightdog Models’ website mentions to expect a slight delay in delivery due to a small correction being needed. 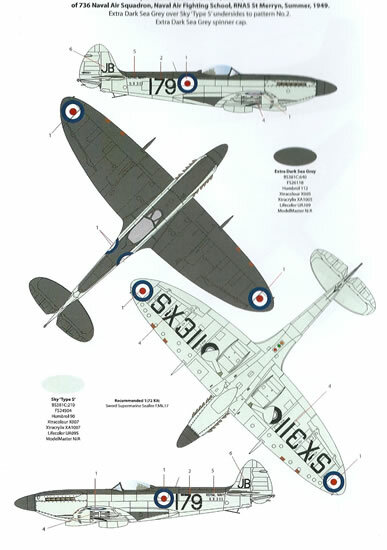 I am guessing from Hannants site that this erratum concerns the under-wing serials for the Seafire F.46 LA545 as they show these two codes on their own small sheet, unlike my sample. Thanks to Freightdog Models for the review samples.